Atlanta Apparel is excited to start off the new year with a record-breaking number of booths, covering four floors with more than 100,000 square feet full of amazing product—20 percent being brand new to Atlanta. Atlanta Apparel makes its 2018 debut today, presenting the latest and greatest in Summer fashions. Taking place Tuesday, February 6, 2018 – Friday, February 9, 2018 (Showrooms and Temporaries: Tuesday, February 6 – Friday, February 9; Showrooms by appointment Saturday, February 10), the Market features new and expanded permanent showrooms, a larger temporary collection and an elevated collection of women’s and children’s apparel, accessories and shoe lines. The Market also features an influencer Q&A session, a fun-filled Kickoff Party and fashion presentation, the highly anticipated Sips & Snaps, a curated Children’s Fashion Show and the Peaches concierge program. Atlanta Apparel’s celebrated permanent collection features amazing lines across several new showrooms including apparel by MUD PIE, Nakamol and Empower Designs all on Floor 8; CP Shades on Floor 9; and VIKOLINO and Samuel Dong on Floor 11. Additional showroom updates include the relocations of Pomegranate on Floor 9 and Vaccerellie’s, Mitchell & James and Winc Apparel on Floor 11 and the expansions of Pretty Persuasions and NICASA and Dreamcatchers on Floors 8 and 11 respectively. “We are so excited for our new home on the Floor 11. This market will be one for the books. The growth from all our lines has been truly astonishing and we really can’t wait to show our retailers everything we’ve been up to,” says owner of NICASA and Dreamcatchers, Nicole Odenwald. 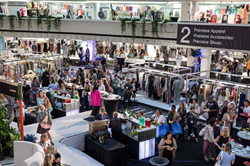 Having presented its largest temporary collection to date last February, AmericasMart Atlanta’s February Atlanta Apparel Market is following suit this year with an equally outstanding Market offering new vendors and increased growth across all categories, especially NOW! Young Contemporary, Premiere Contemporary, Resort, Jewelry & Fashion Accessories and Shoe Studio. “Atlanta Apparel is excited to start off the new year with a record-breaking number of booths, covering four floors with more than 100,000 square feet full of amazing product—20 percent being brand new to Atlanta,” says Caron Stover, vice president of Apparel Tradeshows. With the successful launch of Floor 5 last year, the Young Contemporary collection continues to thrive featuring new collections English Factory/Grey Lab, POL Clothing, Lush Clothing, Elan International and RYU/A’reve alongside returning atrium floor exhibitors Molly Bracken, Dolce Vita and Boho Gal. Atlanta Apparel continues to grow its Resort offerings with more than 30 lines including new-to-market lines Southern Shirt Co., Cabana Life, Diana Rosh/212 Showroom/Colsten, Darby Johns Designs and Atlier showing together in Building 3, Floor 2, complementing resources in the permanent collection. The Market also boasts a luxurious collection of accessories and shoes. Top accessories collections include Lacey Griffin Sales (representing Day & Mood, Anna Beck, Latico Leathers), Harper Made, BudHa Girl, Aviate, Jax Kelly and Able (previously FashionABLE) who has expanded its collection to accessory, apparel and lifestyle products. The top lines in shoes include Bed Stu, Sorel, Very G, Volatile/Sbicca and Kristen Cavallari for Chinese Laundry in its first time in the Premiere collection. The Market’s celebrated Children’s apparel collection previews the newest juvenile fashions and kicks off with the Children’s World Fall 2018 Fashion Show Pre-Party Wednesday, February 7, 2018 from 5:45 p.m. – 6:15 p.m. The main event—the Children’s World Fall 2018 Fashion Show curated by “Earnshaw’s” —begins right after at 6:15 p.m.
Looks from the permanent and temporary women’s collections are showcased in new runway events, Sips & Snaps, featuring Young Contemporary, Accessories and New Exhibitors categories. Kathleen Barnes of “Carrie Bradshaw Lied” discusses the ins-and-outs of blogging and gives a behind-the-scenes look at the life of a top fashion blogger in conversation with Diana Harbour, CEO of Red Dress Boutique. Born in Nashville, Barnes is a renowned fashion, travel and lifestyle blogger currently living in California. She blends her Southern roots with the laid-back West Coast style to create a unique and inspiring perspective. Barnes also serves as guest stylist for the fashion presentation at the Kickoff Party Wednesday evening. Sips & Snaps featuring Young Contemporary Category | 3 - 3:30 p.m.
Influencer Q&A | 10 - 11 a.m. Buyer Brunch | 11:30 a.m. - 12:30 p.m.
Sips & Snaps featuring Accessories Category | 3 - 3:30 p.m.
Children’s World Fall 2018 Fashion Show Pre-Party | 5:45 - 6:15 p.m.
Kickoff Party | 6 - 7 p.m.
Children’s World Fall 2018 Fashion Show with Earnshaw’s | 6:15 - 7 p.m.
Sips & Snaps featuring New Exhibitors Category | 3 - 3:30 p.m.
Atlanta Apparel continues to enhance its best-in-industry buyer experience with the Peaches concierge program. The well-dressed and well-informed Peaches will assist buyers in navigating the Market’s 10 floors of product. For more information about the February 2018 Atlanta Apparel Market, visit AmericasMart.com/February. AmericasMart Atlanta is the nation’s only global wholesale marketplace housing the world’s single-largest collection of home, gift, area rug and apparel merchandise. The largest of AmericasMart’s 16 annual Markets and shows, The Atlanta International Gift & Home Furnishings Market and The Atlanta International Area Rug Market in January and July are the ignition switch for global retailing with buyers from every U.S. state and as many as 70 countries discovering product in more than 1,500 showrooms and more than 3,000 temporary exhibiting companies. ICON HONORS, the home and gift industry’s most celebrated recognition program, is produced and staged annually by AmericasMart. Located in downtown Atlanta, the AmericasMart complex contains more than 7.2 million square feet of space. It’s a huge global stage on which manufacturers, designers and sales representatives unveil new lines, launch new designs and introduce new categories – all for the benefit of buyers seeking all that is fresh and first in the home, rug, gift and apparel arenas. For more information, please visit http://www.AmericasMart.com. Follow us @AmericasMartATL or @AtlantaApparel.